Importance of Proper Oral Hygiene Every day for a Healthier Smile! Visiting a dentist on a regular basis is important for overall oral hygiene. So is taking good care of the smile in-between appointments. Dentists around the world encourage patients to brush and floss their teeth after every meal. This is done to remove plaque and tartar that can sit on the tooth enamel and cause unwanted buildup. Additionally, patients should schedule routine appointments with Dr. R. McKell Young at Ridgeview Family Dental every six months for a cleaning and examination. This allows the dentist to monitor one’s oral health and wellness and get an early and appropriate diagnosis for developing issues such as periodontal disease and tooth decay. All of these actions are proactive ways of keeping the smile healthy. Why is proper oral hygiene so important? Conditions that can develop due to poor oral health care include tooth decay and periodontal disease. Both of these can result in irreversible damage to the soft tissues, the bone, and the natural teeth. 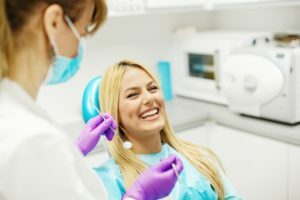 With proper care of the smile between visits to the dentist, patients can reduce their risk of developing these problems in the first place—and improve their chances of a healthy smile. Additionally, when patients visit their dentist every six months, they can be evaluated for signs of any concerns that may be developing. Periodontal disease, for example, is easier to treat in the earlier stages, so an early diagnosis will improve one’s chances of fighting off the infection faster and more efficiently. Patients who have areas of tooth decay may experience larger, more invaisve problems if the issue goes unnoticed and untreated. Early treatment of cavities can maintain the natural tooth structure and keep patients from requiring expensive and invasive procedures later such as root canal therapy. Patients near Ridgeview Family Dental, including the communities of Windsor, Oak Grove, and Warrensburg, MO, are welcome to book an appointment with our team of professionals at one of our three convenient locations. Our front office team can be reached at (660) 747-9117 to schedule a visit at any of offices. We are always open to assisting new patients and families in our state-of-the-art dental facility.